For an commercial popcorn popper that can quickly produce bucket after bucket of fresh, buttery popcorn for hungry customers, look to the PM50R Royalty Series 12 oz. 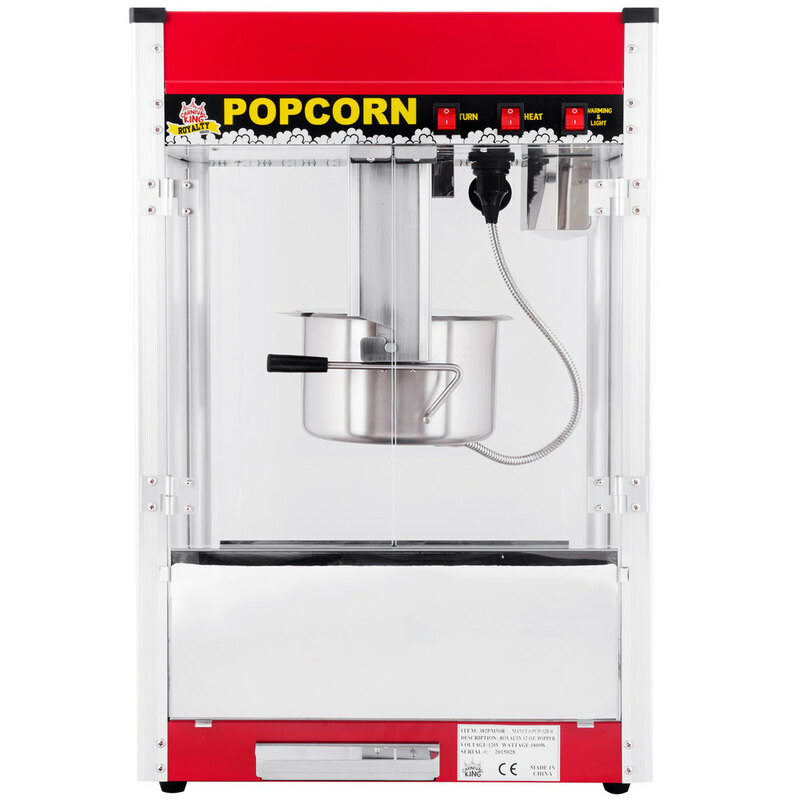 commercial red popcorn popper! Standing at 31" tall and boasting 1800W of power, this machine will keep hot popcorn flowing as quickly as your customers can eat it up! This high-powered machine has a 12 oz. stainless steel kettle that only needs a few minutes to warm up, an ideal feature for high-volume businesses. Once this Carnival King PM50R unit is cooking, the hot, finished popcorn falls to the popper's warm deck, where it's kept fresh until you're ready to serve. This unit will catch the eye of passing customers with its 60W warmer light, which brightly illuminates the finished popcorn for excellent merchandising. Cleanup is just as simple as the popping process because this stainless steel kettle is removable for easy cleaning and maintenance. Each component of the Carnival King PM50R is designed to ensure long-lasting use. The front, back, and side see-through clear panels that make up the viewing area are all made of heavy-duty plastic, while the frame, removable crumb tray, kettle, and interior top / bottom are made of stainless steel for impressive durability. A safety circuit breaker is also included to prevent motor burnout. It comes standard with rubber feet to prevent scuff marks and provide stability. Operation is quite simple, as there are just three switches to control the whole unit! This popper requires a 120V electrical connection.